Hi everyone! 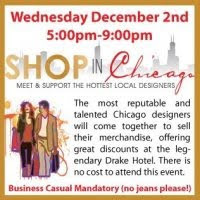 We hope that you will be joining us tomorrow (December 2nd) for Cece & Melinda's exclusive shopping event "Shop IN Chicago" at the Drake Hotel. We are a featured designer among many others and there is no cost to attend!